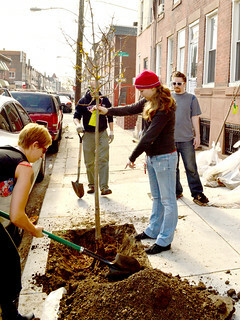 Planting Trees and Loving Parks! NNA volunteers are the greatest! 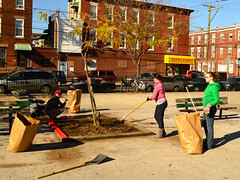 Thanks to everyone who came out to our two big fall events, the PHS Tree Planting on 11/10 and Love Your Park on 11/17. 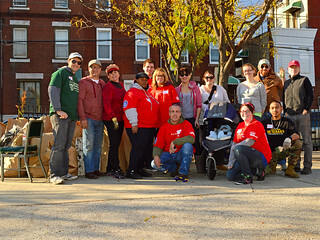 Our Love Your Park event held last Saturday was a huge success thanks to all of our volunteers! Big ups to (in sign-in order) Kathy K, Andrew M, Cara K, Jonathan C, Amanda S, Patrick K, Kyle D, Emily S, Joe S, Alicia W, Frances E, Michelle R, Becky M, Rattanak Y, Matt W, Joe P, Tricia P, Ali J and Melanie M. We were able to weed and mulch all the tress in and around the playground, paint the tree pits, replace old bench beams give the benches a new coat of paint, repaint the hopscotch areas, and build a table area for parents to use while their kids play (covering a space that used to be a trash pit). Stop by DiSilvestro to check out what a little elbow grease and paint can do — hopefully it will inspire many more of our wonderful NNA members to come to the next event!